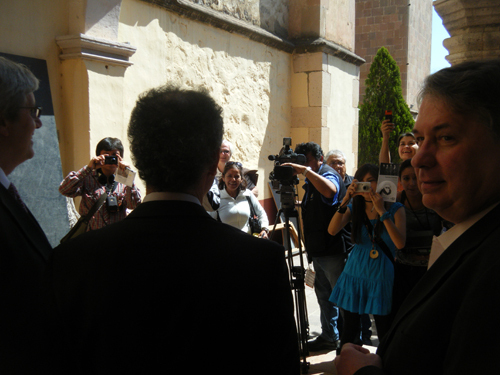 The Emerson String Quartet appeared for the first time last Sunday at the distinguished international festival in Guanajuato, Mexico. Through the festival, the quartet experienced the vibrancy of the Mexican arts scene first-hand, made new friends, and played to a cultured audience that included a crowd of eager, star-struck music students. Having traveled through the Leon-Guanajuato airport several times on the way to concerts in nearby San Miguel de Allende, I was doubly curious to finally visit the storied town of Guanajuato. Told of its charms by many, I was still not quite ready for the town’s historic beauty, manic energy, incredible festival, and its young, enthusiastic audience. The Festival Internacional Cervantino(so named after the Spanish author as he supposedly visited here) lasts three weeks in the fall and hosts musicians of all kinds, and dancers and theater companies from around the world, in the style of the Edinburgh Festival. 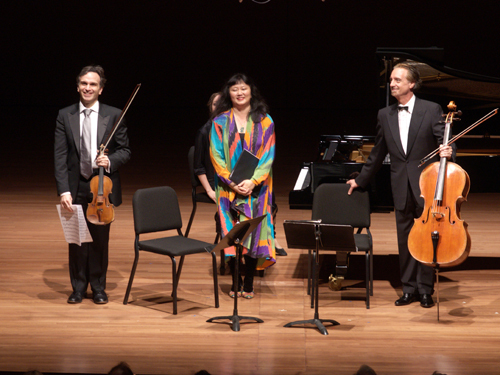 Other artists at the festival this year: the Jazz at Lincoln Center orchestra; the Kodaly String Quartet (who came all the way from Budapest for one concert); pianists Conrad Tao, Lilya Zilberstein and Ivo Pogorelich; the Cloud Gate Dance Theater from Taiwan; and the Deutsches Theater Berlin. In 2010, Mexico celebrates the 200th anniversary of its independence from Spain. A special route traversing the country’s historic cities is designated Ruta 2010, and the festival and the town are bristling with pride and happiness. Guanajuato was central in the uprising that led to independence, many of its old buildings and neighboring towns wrapped up in the history. 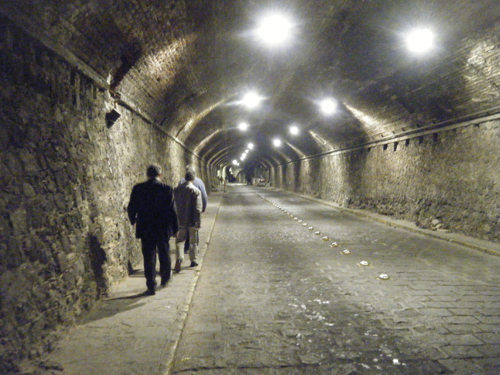 Under the city, pedestrian and vehicle tunnels, formerly rivers, keep the cars off the quaint streets above. Our concert was presented in the suburb of Valenciana, just north of the city, in the magnificent Templo de la Valenciana, a church whose ornate bell tower can be seen for miles. 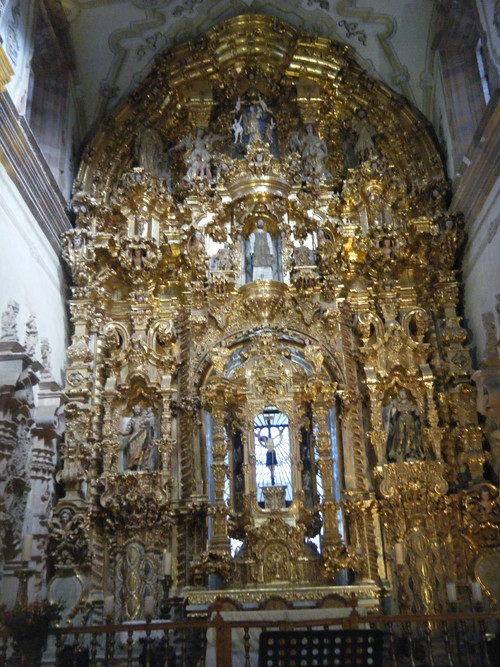 What is not seen for miles is the incredible gold work in the interior, dazzling to the eye. 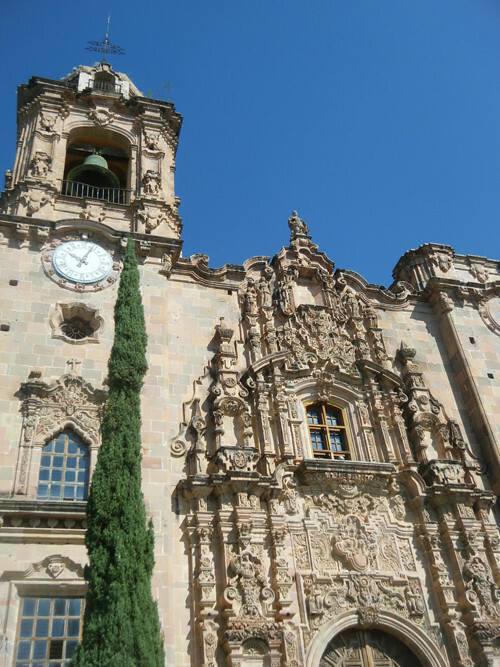 As the Guanajuato area was once the world’s leading producer of silver, the church was built with money from the nearby mine, and rumor has it that the rich, red mortar contains both silver and wine. 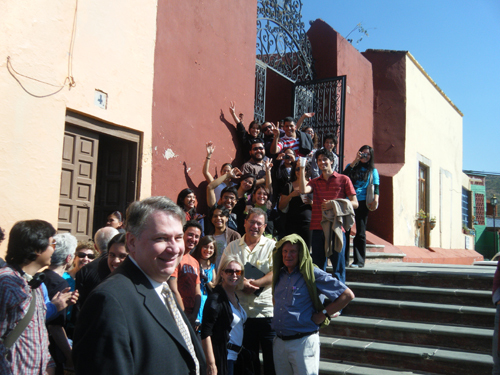 Young musicians were lined up on the steps of the church even before we arrived for rehearsal, a touching sight. Some of them had journeyed over nine hours to attend. We were given the warmest of welcomes. The program – chosen by the presenter – was far from festive, with two of the quartet literature’s most depressing pieces, the Bartok 6th and Shostakovich’s 8th, closing each half. The little 2-movement Haydn Op. 103 (ending angrily in d minor) and Mendelssohn’s final work, the Op. 81 Andante and scherzo (also ending softly in minor) did little to dispel the inescapable atmosphere of doom. Coincidentally, three works on the program were actually the composers’ last quartets, and the Shostakovich could have been if the Shostakovich had actually gone through with his veiled threat of suicide, written about at the time. From the way we greeted after the concert, however, you would have thought we’d played the most lively, happy music ever composed. A throng of young musicians, including some who had travelled nine hours to hear us, crowded the doorway as we emerged into the bright afternoon sun. 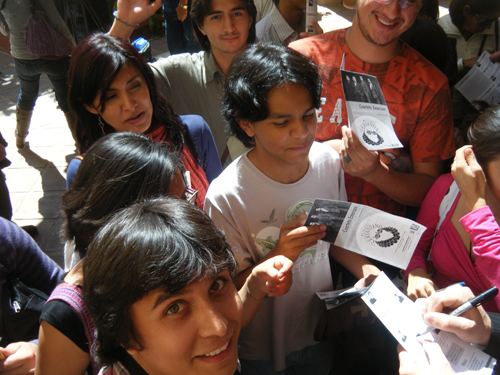 I don’t think any one of them left without both an autograph and a picture. Gene was selected by the television crew to stand in front of the cameras and say “The excellent expressivity of the Emerson Quartet, brought to you by WGXR” (I don’t recall the exact station name), which he gamely did in front of the entire crowd, and us, which didn’t make it any easier. Heading back to New York on the same evening, we will long recall the faces of the enthusiastic young listeners, and wait and hope for an invitation to return to this incredible festival. 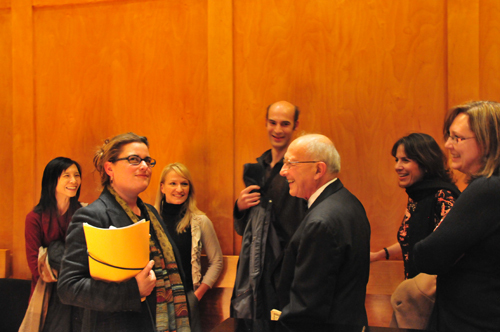 Music@Menlo and Stony Brook University honored pianist Gilbert Kalish at a concert by him and the Emerson String Quartet, marking the legendary pianist’s 75th birthday and his 40th year on the Stony Brook faculty. 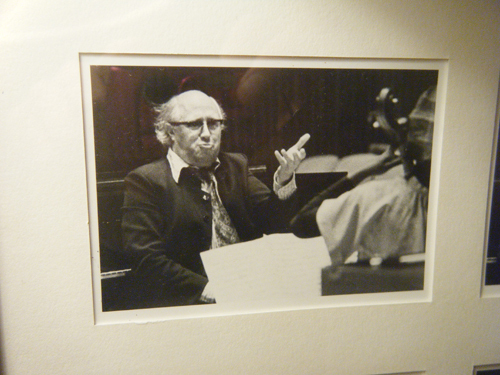 In addition to creating a scholarship in his name, the University underwrote a special edition Music@Menlo Live 2-CD set of Kalish’s performances of the three Brahms Piano Quartets. Birthdays are inevitable, but the building of an artistic legacy is largely optional, the responsibility held primarily in the hands of the artist. Gil Kalish has formed his not only through a vast number of concerts, but with every single relationship he has had, with performers, composers, educators, and notables of the music industry. He is known to all of us as a true servant of the art, someone in whose hands classical music has made progress in many ways. He is a pianist of the highest rank, with sound and technique equal to anyone of his generation. His skills as a collaborator are unsurpassed, and he has enjoyed long partnerships with some of the most distinguished vocalists and instrumentalists of our time. He is the most thoughtful of musicians, endlessly respectful of the composer and knowing his place as an interpretive artist. Yet his sense of music as a living art – one that requires daring, spontaneity, and change – is ever-present in his performances, no matter what the repertoire. These qualities have made him, over the years, the most desirable of pianists, and he still commands the stage, as he did in the Brahms Quintet with us in this concert, like no other. 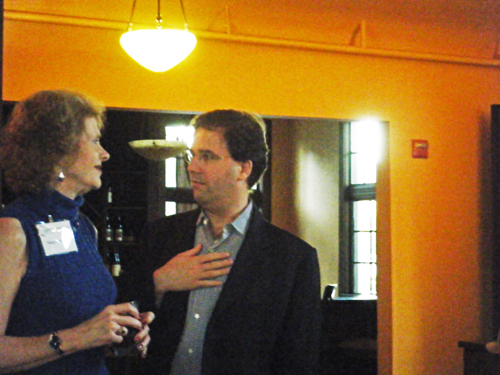 The surprise celebration was largely the inspiration of Philip Setzer, who brought all parties on board to support the event, the scholarship and the CD production. Present in the hall were many former students of Gil; University and Music department administrators, and Wu Han, who came especially to pay tribute to Gil from the double perspective of pianist and artistic administrator. 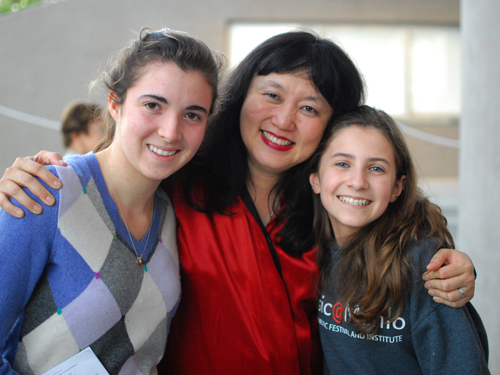 After speeches by Stony Brook faculty and administration, including Music Department Chairperson Judith Lochhead, University President Samuel L. Stanley, and Wu Han, the entire audience joined Gil and his family in the Staller Center lobby for cake and more speeches. The Brahms Piano Quartet CD idea was a long time coming. Ever since we first heard Gil play one of these works, at Music@Menlo 2003, we knew that we were hearing something incomparable. We decided right away to schedule him, in succeeding summers, to play the other two, so that eventually the festival would have a complete set from him. With his performance of the g minor in the summer of 2009, the cycle was complete, and, growing impatient, we cut at a dedicated set of two CD’s at home from the various Menlo Live box sets. The result was so compelling that it became obvious that sharing these performances with the world, in honor of Gil’s artistry, was something we had to do. World-class performances of classics by the great composers are truly hard to come by. In the case of Brahms, one must either possess or muster up strength of character, an uncompromising integrity, which comes close to equaling that of the composer. With one foot in the romantic age, and the other in the classic, Brahms wrote music which contains all the warmth, tenderness and full-bloodedness of composers such as Schumann and Dvorak, yet the importance he placed on the tenets of the classical age – balance, reason, economy and structure – demand that his music be played with clarity and discipline. Far too often, performances lack one side or the other. It is rare to find musicians who not only understand this, but can actually do it. Gilbert Kalish is one of them, and for that reason, we recommend these performances as definitive. 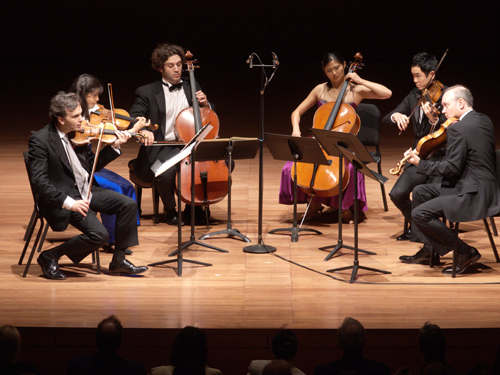 The CD was produced by ArtistLed in cooperation with Music@Menlo and the State University of New York, Stony Brook. 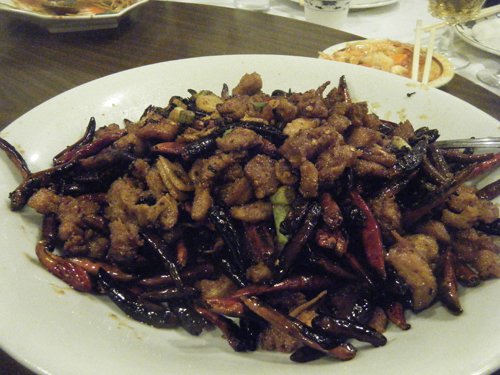 The recording and mastering, as well as the cover photo, are by Da-Hong Seetoo. 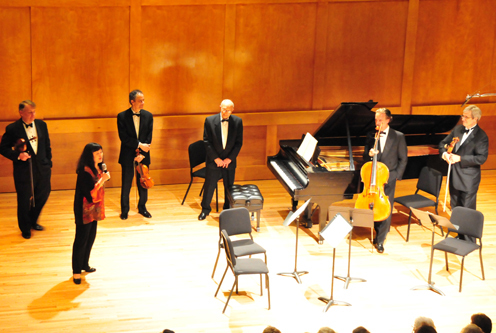 The participating musicians graciously donated their performances gratis to support the scholarship fund. The CD will be available through the Stony Brook music department and through Music@Menlo’s website as of later this week. We will post the ordering details here once they are confirmed in the coming days. 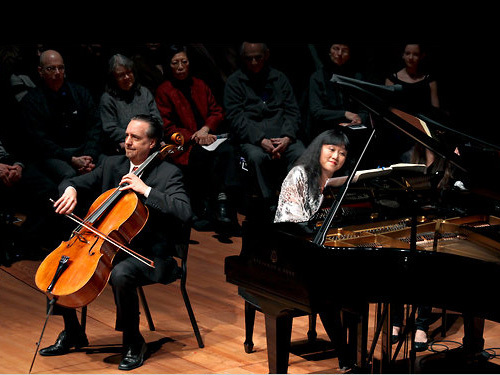 David Finckel and Wu Han inaugurated their 2010-11 duo season with a performance of the complete Beethoven Sonatas for piano and cello on the Cal Performances series at UC Berkeley. It was the duo’s second appearance for the distinguished Bay Area series, and the duo’s fifth performance of the Beethoven cycle this year, following New Orleans, New York’s Alice Tully Hall (for CMS), the Aspen Music Festival, and Music@Menlo. Cal Performances, founded in 1906 at the University of California, Berkeley, has steadily grown to become the most comprehensive performing arts series in Northern California. 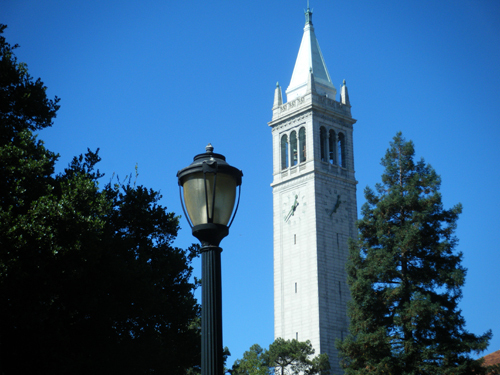 The organization presents over one hundred events annually in five venues in and around the campus, drawing its audience from the famously open-minded, diverse population of the Bay Area, and from among UC Berkeley’s thirty-five-thousand brilliant students. 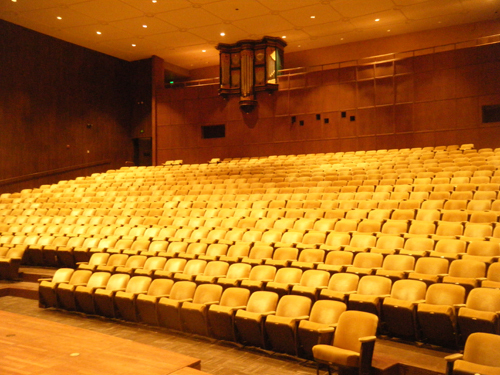 Hertz Hall, named after one of the early conductors of the San Francisco Symphony, is a 1000-seat venue with perfect acoustics for chamber music. It was a real pleasure to play the sonatas there, not only because of the hall but on account of the intensity with which the public engaged themselves in the music. I could see neither empty seats nor anyone checking their e mail! 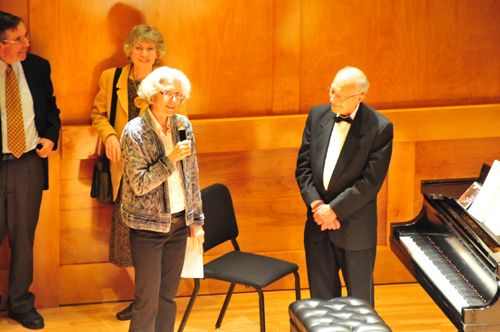 After the long concert, which included Wu Han’s signature introductions to the pieces from the stage, we were given a reception courtesy of Music@Menlo board member Kathy Henschel. Kathy, an avid supporter of the Berkeley Symphony, Chanticleer, Cal Performances as well as Music@Menlo, made a passionate speech, encouraging everyone to support many Bay Area arts organizations in the belief that a community can never have too much of a good thing. She had brought brochures for all her organizations, and her inclusive advocacy was gamely embraced by Cal Performances director Matias Tarnopolsky, who warmly praised both Kathy’s vision and character. We could not have agreed more and were very proud to be able to call her one of Music@Menlo’s own. 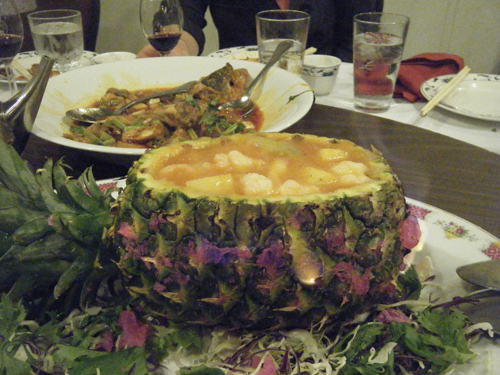 After the reception we gathered our Music@Menlo contingent (Kathy and her friend Chris, Executive Director Edward Sweeney and Development Director Annie Rohan) and met up with family at the China Village Restaurant in nearby Albany (www.chinavillagesolano.com), the only Michelin-starred Chinese restaurant in the Bay Area, for a custom-ordered Szechuan meal, which included “REAL kung-pao chicken” (according to Wu Han), many other dishes way to delicious to describe, and a flaming pineapple filled with shrimp and pineapple. Matias Tarnopolsky also joined us, and it was inspiring to hear this very young director (who has just in the last year taken over the position) speak of his vision for the organization, his innovative projects, and his commitment to quality experiences for his audience. We very much look forward to our return engagement there next season. Music@Menlo broke new ground on a beautiful Sunday afternoon in Menlo Park, as the Emerson String Quartet inaugurated the festival’s new Winter Series. 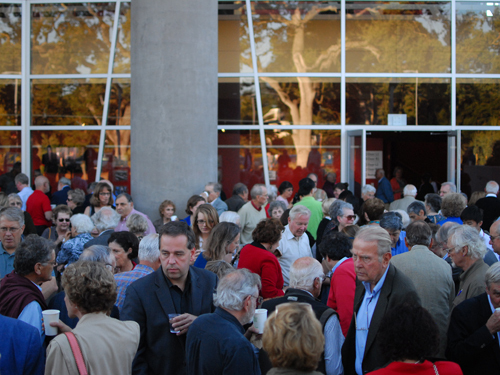 A long-time consideration, the Winter Series now provides summer festival audiences with performances during the year, programmed and directed by the festival, and presented with Music@Menlo’s signature quality and integrity. What a thrilling day it was for Wu Han and me, and for the entire Music@Menlo community, to open a new chapter in the festival’s history. The possibility of a winter series had been discussed for years and finally came to fruition between the festival’s eighth and ninth summers. As with every step in the development of the festival, this one waited until its timing was right: our attendance has been near capacity every summer; audience members, including many donors, have expressed their hunger for an off-season presence; and Music@Menlo’s year-round staff is at a peak of productivity and experience, ready and able to take on the responsibilities of presenting concerts in a new format. The Winter Series offers Music@Menlo two important opportunities: first, to reconnect on a regular basis with our audience during the long winter months; and second, to reach an audience that is unable to attend in the summer. The single concerts acquaint new listeners with the festival’s quality through individual performances; and we, as artistic directors, have the option of selecting from a wide field of artists and pre-formed groups touring during the regular concert season. The group we chose to inaugurate this entire series just happened to be the Emerson String Quartet. 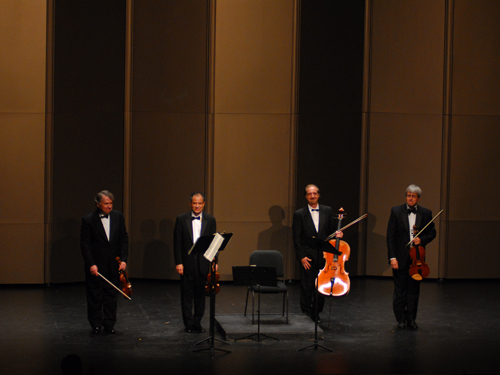 The ESQ had appeared only one time for Music@Menlo, in our 2005 Beethoven festival. Naturally, it is with enormous pride that I am able to show off Music@Menlo’s great audience, state-of-the-art production, and overwhelming hospitality to my quartet, which I know from experience is well-acquainted with the world’s top series and venues. Likewise, it is gratifying for me as the festival’s artistic co-director to bring to the new series a concert which I know will satisfy on all levels and provide the project with a stellar launch. The performance, long sold out, took place in our newest venue, the Center for Performing Arts at Menlo-Atherton, in which we presented a number of concerts for the first time this past summer. This beautiful hall, designed primarily for chamber music, provides the fine acoustics our audience has come to expect, and in addition, elegance, accessibility, and enough seats to accommodate the large crowd the festival now draws for single performances. The program we selected, from the Emerson’s many season offerings, comprised works that each had a tie to a previous Music@Menlo summer. 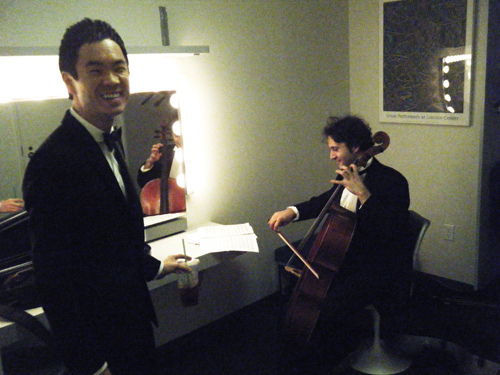 We began with Mendelssohn’s last completed work, the Andante and Scherzo, Op. 81, which of course recalled for us all the 2009 festival Being Mendelssohn. Anton Webern’s Langsamer Satz (Slow Movement) followed, a romantic gem which was featured on our very first festival in a program titled Bridging the Ages. Debussy’s only string quartet, one of the great masterpieces of the literature, closed the first half, recalling the Spanish Inspirationss program of just last summer, in which the quartet’s guitar-like second movement helped draw connections between the music of Spain and France. 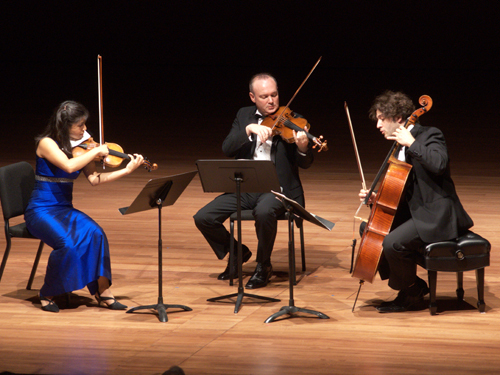 And finally, Dvorak’s magnificent quartet in C major, op. 61, rounded out the program. In last summer’s closing concert, Dvorak’s America, our audience heard the two great chamber works that the Czech composer wrote during his stay in America, filled with melodies, harmonies, and rhythms inspired by Native and African-American music that he heard here. The work on this Winter Series concert was composed during a different era of his life, when he was fast becoming a major European composer, earning the respect of not only his countrymen but of internationally famous musicians such as Johannes Brahms. With this quartet, of the same large dimension as a middle-period Beethoven work, Dvorak sought to put himself on the same plane of skill and importance as his most distinguished contemporaries. 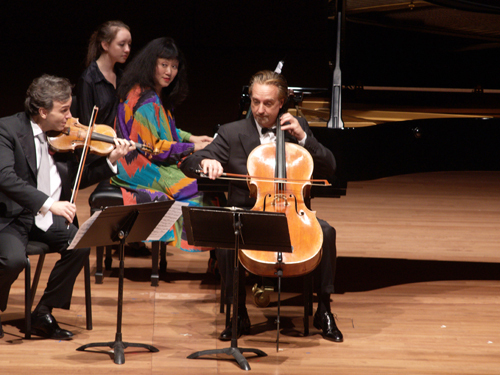 My quartet, coming from consecutive-day concerts in Costa Mesa and San Diego, gave its all for the performance and basked in the warmth and enthusiasm our audience showed in return. An encore of one of the Dvorak Cypresses closed the program. Looking back on the concert, in the context of the history of the festival, we are happy to have been able to present three works that recalled performances of past summers, and to also introduce a work, the Dvorak, which our audience had never heard. 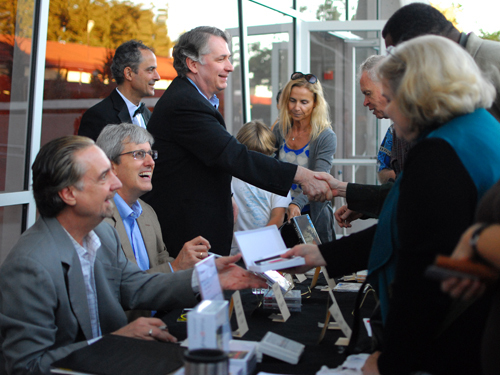 The post-concert activities included a CD-signing for the quartet and the opportunity for us to greet our public once again, which happily included many Chamber Music Institute students. 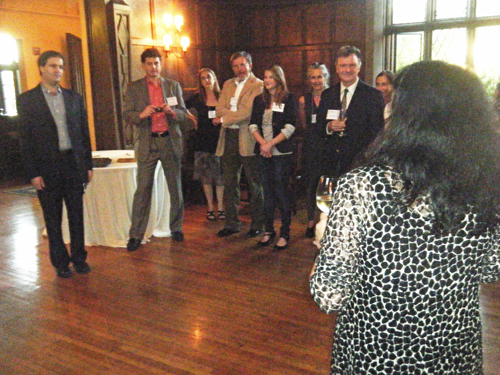 We relaxed and enjoyed the company of Music@Menlo board members and donors at a beautiful party and dinner graciously and generously hosted by Hugh Martin and Amy Sapp. 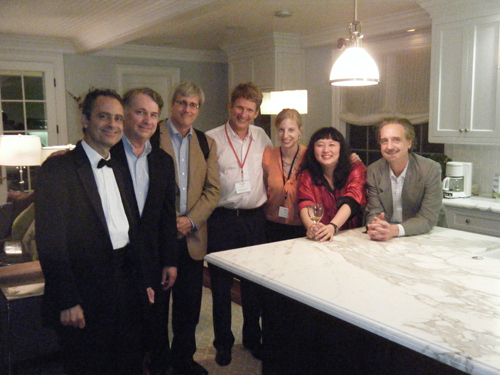 During the evening, Wu Han (who made the trip out especially to see the series launch) and I enjoyed seeing Gene, Larry, and Phil getting to know many of our extraordinary board members: Ann Bowers, Leonard Edwards, Paul Ginsburg, Kathy Henschel, Michael Hunt, Hugh Martin, Bill Silver, Camilla Smith, and Trine Sorensen. Music@Menlo’s Executive Director Edward Sweeney and Director of Development Annie Rohan helped everyone to get to know each other and made sure that the quartet was amply fed and entertained. 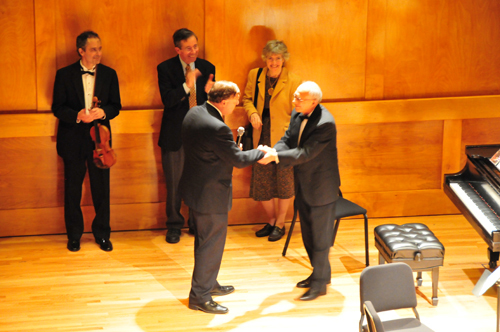 It was truly a great evening, one whose quality matched the landmark significance of the day for Music@Menlo. In resonance with one of CMS’s currently ubiquitous street posters describing chamber music as “Small is the New Big”, the Society opened its 41st season with a program of works for intimate ensembles. 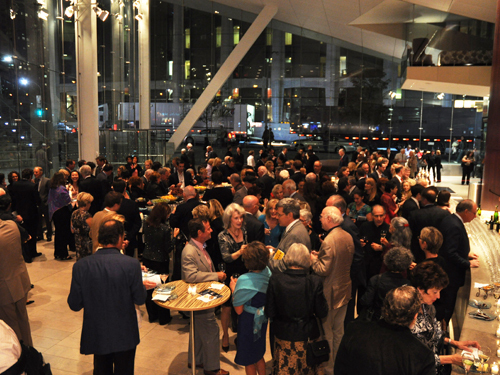 An enthusiastic, full house thoroughly enjoyed three chamber music gems which resonated in the vibrant beauty and clarity of the recently-renovated Alice Tully Hall. Programming an Opening Night concert is an exciting challenge, filled with opportunity. We know that the audience will be eager, and that many devoted listeners may have survived a whole summer with little or no chamber music. Others will be relieved to get back to the state-of-the-art Alice Tully Hall, having endured summer concerts (however enjoyable) in parks, barns, sheds, tents and other places where everyone (not to mention the music) is at the mercy of the elements. And, in the most natural way, people will be looking forward to seeing each other, to sharing summer stories, and to hearing music together once again. It’s our responsibility to provide a concert that not only enhances the celebratory atmosphere, but also bears the CMS stamp of performance quality and programming integrity. When we learned (after a considerable number of tries!) 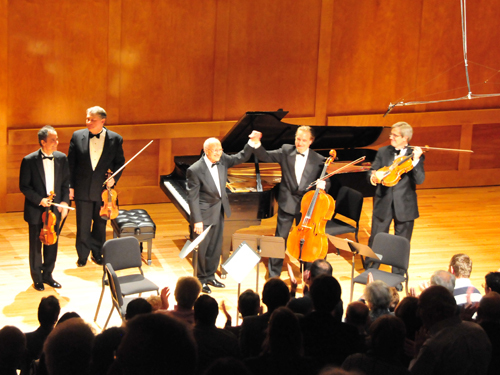 that violinist Gil Shaham could join us on this date, we knew we were well on our way to a successful evening. We were also fortunate that Gil’s wife Adele Anthony, a brilliant violinist now seemingly as busy as her husband, was also available, and from there unfolded quite naturally a program of beautiful music which showcased their abundant gifts. We have heard both of these violinists play many times. As recently as last summer, at the Aspen Music Festival, we were there to hear Adele play a flawless Beethoven “Kreutzer” sonata, and were amazed, as was the rest of the crowd, to witness Gil in a stunning Tchaikovsky concerto on short notice, substituting for Janine Jansen, who had taken ill. Hearing how great both of them sounded only whetted our appetites for their appearances under our wing, and for our audience. Hereby confessing to a bit of selfishness, Wu Han and I asked Gil to open the program with just the two of us in Haydn’s famous “Gypsy” trio. Rehearsing with Gil was a pure joy: he treated the performance of the trio with the same seriousness and care he must devote to the Brahms concerto. Haydn’s score, with hardly any interpretive indications, calls for playing of imagination and conviction, and Gil delivered at the highest level on both accounts. As one might expect of such an experienced soloist, it was incredibly easy to know what he was about to do, and that provided our little ensemble with a high possibility of spontaneity. Gil was open to any and all ideas, constantly writing things in his music which, I have the feeling, he may have used only as suggestions when it came to the concert. Nonetheless, he gave an inspired, tasteful and instrumentally superior performance that helped set the standard for the entire program, and for the coming season. After a breath-taking run to the dressing room to leave my cello, I just made it into the hall to hear the next work on the program, Dohnanyi’s Serenade for violin, viola and cello. Joining Adele were violist Paul Neubauer, and cellist Nicolas Altstaedt. Nicolas had just arrived over the weekend in a blaze of glory, fresh from his debut as the Credit Suisse award winner, in the Schumann Concerto at the Lucerne Festival, with no less an accompanist than the Vienna Philharmonic, conducted by Gustavo Dudamel. Yet, this brilliant young cellist threw himself into our concert (like everything he has done at CMS) with equal passion and dedication, qualities which have endeared him to all of us. Paul Neubauer lent his unequaled poetic gifts to the beautiful viola solo which opens the second movement, and Adele fearlessly nailed everything in the death-defying scherzo. 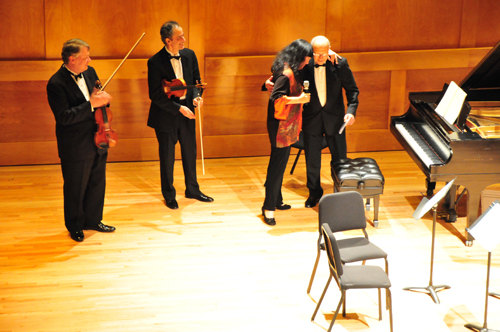 It was easily the finest performance of this difficult work I had ever heard, and the audience shared my enthusiasm. After intermission (which included much friendly getting-together in Tully’s beautiful lobby and Hauser Pavilion upstairs), Adele, Paul and Nicolas returned to the stage, bringing with them cellist Sophie Shao, violist Richard O’Neill, Gil Shaham, and Brahms’s Sextet No. 2 in G major. Easily one of Brahms’s most popular works, the sextet was composed in 1865, more or less on the happy (for him) occasion of Brahms’s decision to give up trying to have a wife and a family and that he would simply concern himself with being an artist. (This didn’t mean that he had lost interest in women, but that’s a story for another post!). This is a work I have played many times, recently: two seasons ago with the Emerson in New York and London (also with Paul Neubauer); three seasons ago with a group from CMS on Live from Lincoln Center; and most recently, this past summer at Music@Menlo. So it was a special pleasure to sit back and enjoy this great piece while others did the work. It’s hard to resist the opportunity to talk about this piece – so I won’t. The first movement has extraordinary features, among them: the most unusual accompaniment to the main theme, composed of an oscillating half step in the viola and isolated pizzicati in the second cello; a theme built with open fifths stacked consecutively, one a half-step above the former, descending in a simple arpeggio. The second fifth – on the out-of-the-key pitches Eb and Bb – lends a dark feeling to the otherwise tranquil melody, especially when the viola’s lower oscillating pitch (F#) can be heard enharmonically as Gb, completing an Eb minor triad with the Eb and Bb in the melody. Too technical for anyone? Sorry, but this is, in the words of Rob Kapilow, “What Makes It Great”. The second movement is the most haunting, melancholy and serene scherzo imaginable. It feels like looking out the window at a rainy day, but being by a warm fire all the while. Little mordents, which are like short trills, adorn the gently dancing melody, giving it a kind of throbbing, emotional quality which it would not possess without them. A raucous middle section or trio interrupts, completely out of character with rest of the movement. But Brahms was not a composer to apologize for anything, and its appearance here is definitely completely in character with the composer’s Beethoven-esque side. The slow movement is a set of variations that unfolds gradually. Once again, a simple main theme is accompanied by a complex figure – pairs of eighth notes against triplets in the second violin and viola. It’s in E minor, and it’s very stark and sad. The first variation gets even starker and sadder, until the second variation, in the guise of a little fugue, breaks in violently, leading to the next variation which is even more angular and wild. It’s as if Brahms started out sad, and gradually got angrier and angrier. However, at this point the anger breaks, and the music moves to a heavenly E major, with rocking sixteenth notes suggesting a more substantial melody that can only be imagined. A pedal point in E in the second cello anchors the coda, which contains some of the most beautiful music, I think, that Brahms ever wrote. The finale is all fun, fast and light, with a beautiful, legato theme on the first violin’s rich, lowest string. It’s tricky to play well, but highly rewarding by the end, where Brahms manages to work in real fervor and a sense of triumph. It was especially nice to welcome back to our stage for this concert Sophie and Richard, two former CMS 2 artists who have hardly ever really left. Together with the Shaham family and Nicolas, they delivered an exciting performance that sent our listeners out in a good mood – as they had entered. Our work was done for the night. It’s a good opportunity right here to express our gratitude to the artists, who put so much of themselves into making this opening concert the success it was. We look forward to working with all of them again.